Neeraj Kumar Mishra joined Ek Soch Sandbox in 2016. Prior to working in LEAD, he worked for one year of project documents and all over logistics and office supporting role. Later on, he started handling all over the account, HR, reception and internal office management work. He did fellowship program in 2015 and worked as Program Assistance in Akansha teachers Training Program of DET. 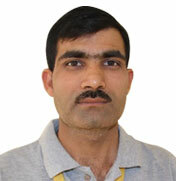 He has teaching experience of 6 years in Junior High school Neelgoan and One-year experience at Govt. Inter College Neelgoan.